This 14 hectare property was acquired in 1974 by the Lower Thames Valley Conservation Authority. It was named after the owner who donated the site to the Rotary Club in 1956. The area was operated by the local service club as a youth camp and continues to serve in this capacity as a conservation area. The staircase to the beach has been removed as well as the bridge at the bottom of the ravine because they were unsafe and beyond repair. A walking trail will replace these structures as time permits to develop. E.M.Warwick Conservation Area is located at 26135 Warwick Line on the north shore of Lake Erie between Wallacetown and Eagle in the Municipality of West Elgin. Follow Talbot Trail (Hwy 3) east from Eagle, take McKillop Side Road south for 3 km. E. M. Warwick Conservation Area is located to the east off of Warwick Line. There is a main hall that has picnic tables, a serviced washroom with a shower, and a kitchen. Group camping is available with four cabins. Camping reservations are necessary. For camping and facility rental fees click here. Tel: 519-354-7310 or Email: info@ltvca.ca. Winter use is available. 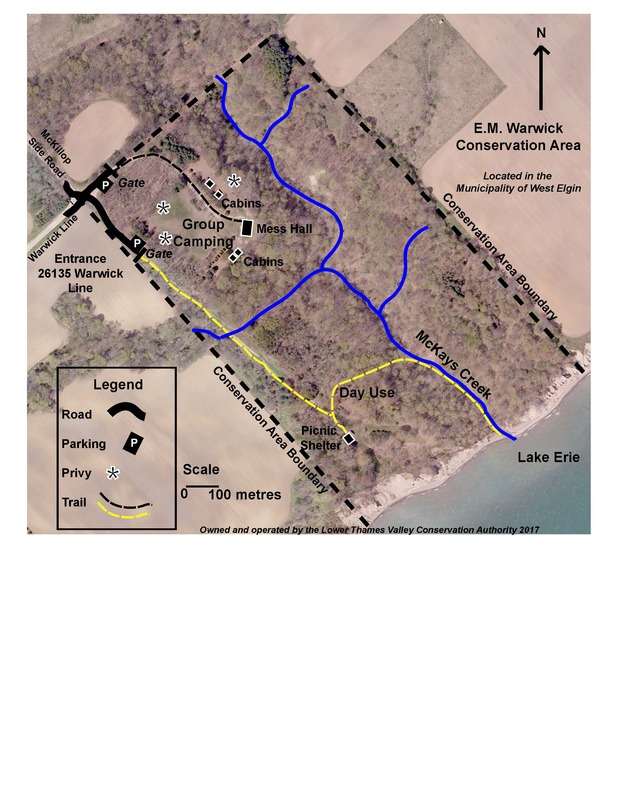 E.M.Warwick Conservation Area is located on the north shore of Lake Erie. Wooded Carolinian forests and ravines, streams and open space support abundant wildlife.